Help with alfa 156 - central console. Thread: Help with alfa 156 - central console. After 4 hours of reading I must admit you have a really nice place here. Everybody seems to be doing really well when it comes to modifying consoles.... and that's why I'm posting now. I'm starting my own car pc project. My car is an Alfa 156 '00 (before the face lift). 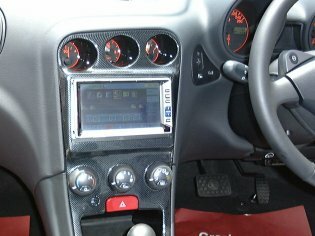 Problem is that the central console has no space for a 7'' touch screen lcd. 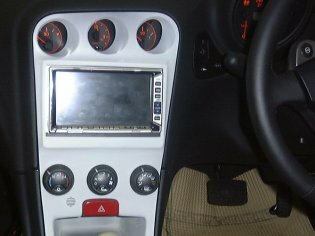 After doing a bit of research I found some website from china and a couple of pictures of a car just like mine but with the lcd fitted in. Now, I bought a central console minutes ago from ebay (also in carbon-fiber style) but I'm not really good at doing this kind of stuff. Is it somebody around here (london or within 40-60 miles) able/willing to help me (will pay, nothing to worry about that) to get it the way I need it? Its surprisingly easy to do. A lot of planning and reading, a dremmel and some fibreglass is all you need. I recommend looking at Gommers fabrication with stretched lycra as it works well. I bought some at my local market for 3 quid. I was thinking about a 156 a few months back so obviously the dash was taken into consideration. Moving the knobs seemed the sensible choice and relocating them to the ashtray was the only real option. Found some pictures with the things beneath the panel here. I'm not sure a CF style coating is a good choice though. 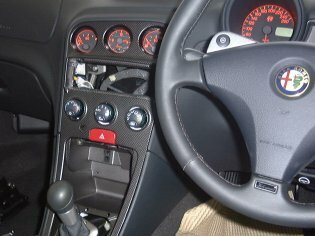 Would the facelift dash that included a sat-nav fit if there was such a thing? IIRC the GTV's have a similar layout and I know there's a carPC in one of them.. The CF is just an effect. Some sanding and a coat of paint and it will be gone. Those lower dials look a bit close to the edge. It would be more work but gutting out 5mm or so between then and moving them together would end up with a much nicer finish. Assuming they arent fixed behind the dash as one block. EDIT Just seen your link and they are in one unit so thats that idea buggered. Last edited by Baj; 22-02-2008 at 01:31. Yes, the CF effect will be changed with a new coat of paint (silver or black). @Baj: yes, the dials are fitted in a block so it's better to leave them as that and just move them a bit lower. @Rob, no, the gtv's console has some extra buttons and I think the sizes are not the same. I'm about to start my 1st attempt, planning and the right tools along with lots of time spent on the forum seeing how others have done it before me I'm hoping is a winning formula. CookieMonster, did you finish this project and if so how did it turn out ? Well the OP was egzplicit and he hasn't posted since this thread so we have no idea how that went. As for cookiemonster he had his own thread where it seems he wasn't installing in an Alfa. I realized right after I posted that is was egzplicit that started the thread and that he hadn't posted anything more so I'd though I'd wait and see if cookiemonster had any progress. But since he wasn't even doing an alfa console, I'd just have to try it my self and post some pictures here. although I did get rid of the gauges and used centrafuse to display the info instead.